The Problem: Although sea turtles have spiritual or mythological importance in many cultures around the world, this has not prevented humans from consuming their eggs or meat. In many costal communities, especially in Central America and Asia, sea turtles are considered a food source. During the nesting season, hunters comb the beaches at night looking for nesting females. Often, they will wait until the female has deposited her eggs to kill her. Then, they take both the eggs and meat. In some countries, sea turtle eggs are prized as an aphrodisiac. Others customarily consume sea turtle meat in observance of religious holidays. For example, in Mexico, thousands of inland residents journey to Pacific coastal communities during the week preceding Easter in search of sea turtles and other seafood. During this short period of time, as many as 5,000 turtles are consumed in this region alone. Until the 1970s when sea turtles were internationally recognized as endangered, their meat was also used to prepare turtle soup- considered a specialty by Europeans. Additionally, people may use other parts of the turtle for products, including the oil, cartilage, skin and shell. 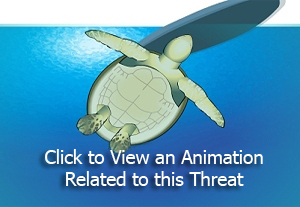 Species Affected: The most commonly eaten sea turtle meat comes from the green sea turtle. However, loggerheads, ridleys, and occasionally hawksbills and leatherbacks are also consumed by humans in various regions around the world. * Government-imposed limits on consumption. Case Study: One of the most important areas for sea turtles outside the United States is Mexico. In this area five of the seven sea turtle species will grow and reach maturity in the lush feeding grounds. The study estimates that about 35,000 sea turtles are consumed every year in northeast Mexico alone. When the population has only one out of every 1,000 hatchlings surviving to maturity, their numbers have depleted exponentially. One of the reasons for mass consumption is holidays such as Easter or Semana Santa because of the Catholic tradition of consuming seafood during the season of Lent. Show your support with a tweet!